Full garden plan with constructional drawings for large family garden. A classical design to compliment the house. The garden has a large area for entertaining, a water feature and a variety of areas in which to find privacy and contrast. 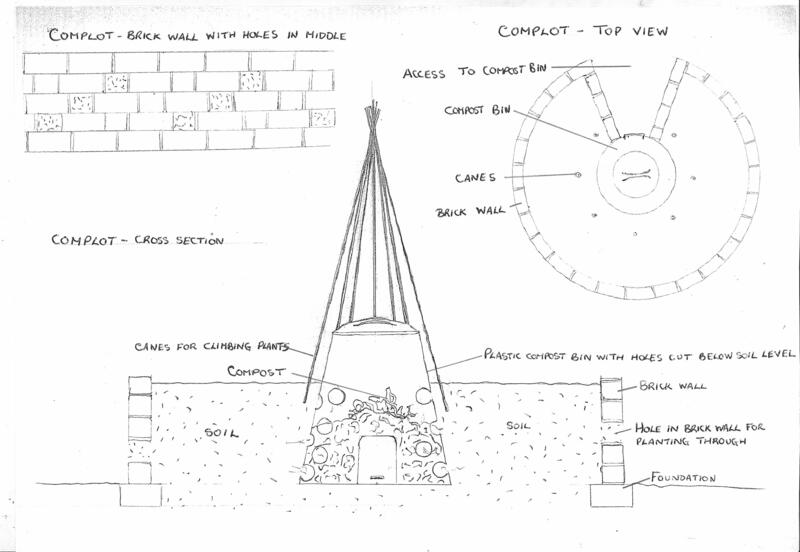 Full planting plan for the garden above. 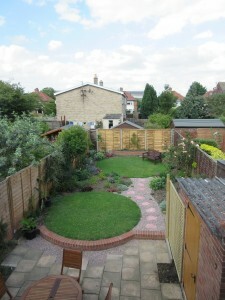 This includes sunny mixed borders, shaded woodland beds and a formal herb garden. Community Garden at Empty Common, Cambridge. 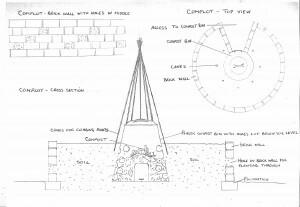 This is a design which enables the demonstration of permaculture and organic gardening techniques. However, it integrates many gardening styles in order to offer a dynamic, versatile and productive community garden for everyone. 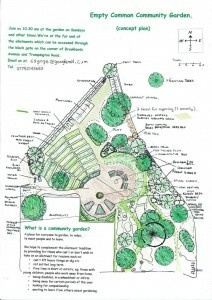 Rough drawing of Empty Common Community Garden plans. 1) While the grandchildren are young a mesh and boulders with a bubble jet fountain near the edge allow for safe playing. 2) When the grandchildren are older the mesh and boulders can easily be removed to make a proper pond where the children can pond dip and discover nature first hand. A low maintenance structural garden designed to give a large private outdoor area for entertaining, add instant structure to the very flat garden and to provide some space for home grown fruit and vegetables. All-in-one “Complot” design combining composting into a raised bed. This design is untried and a bit of an experiment which I hope to trial this summer. I have used the measurements of a standard plastic compost bin but these vary in size, design and strength. The idea is that the composting is conveniently situated and that the composting process going on in the middle will attract invertebrates and soil microorganisms which will transport compost and nutrients out into the surrounding soil. It would be ideal for a small back yard. There are mulptiple layers for plant growth with holes in the sides of the brick wall, the raised bed surface and then the poles for climbers. If this design works then I will design more aesthetically pleasing versions. The standard plastic composting bin may need reinforcing to keep its shape once the holes have been cut through it. The size and number of holes may need to be adjusted. There may not be enough air getting to the compost. Rats may dig down through the soil to get to the compost though the underground holes. There may not be enough invertebrates to start with, it might be useful to import some worms. If the compost is watered rather than the soil surface this will spread into the soil low down so there will be less evapouration. However one would have to avoid getting the compost waterlogged as it needs to stay aerobic to make good compost. It would be a matter of adjusting watering habits to the needs of the compost bin and the raised bed. 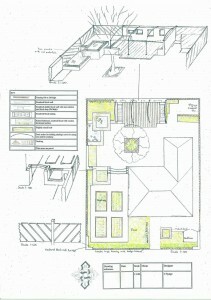 Design for a micro-farm/ learning centre. 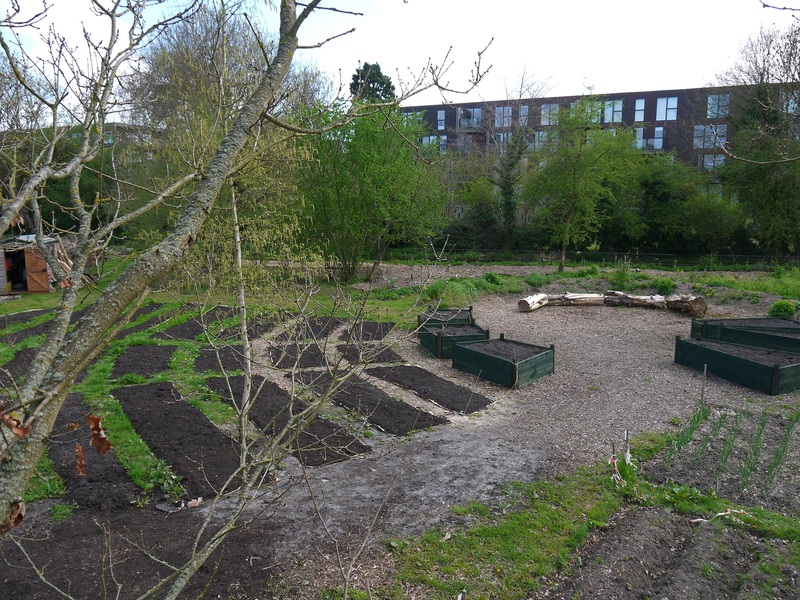 This was a joint project with five of us working together at the end of an intensive Permaculture Design Course. There are some mistakes in here but that is part of the learning process. It was a great course where we all learned a lot. What surprised me was that all except myself were in their twenties. It gives me hope that the next generation will really care enough to make the changes required. Suburban garden with some produce incorporated. The two circular flowering lawns form the basic design of this garden. The remit for this garden was to convert a very plain garden (utilitarian rectangular plot of grass with a strip of bed around the sides and square patio beside the house) into a more interesting flower garden. The lawn in partial shade is intended to grow selfheal, buttercups and crocus, the other is intended to be mostly daisies. Clover has volunteered to join in on both lawns. 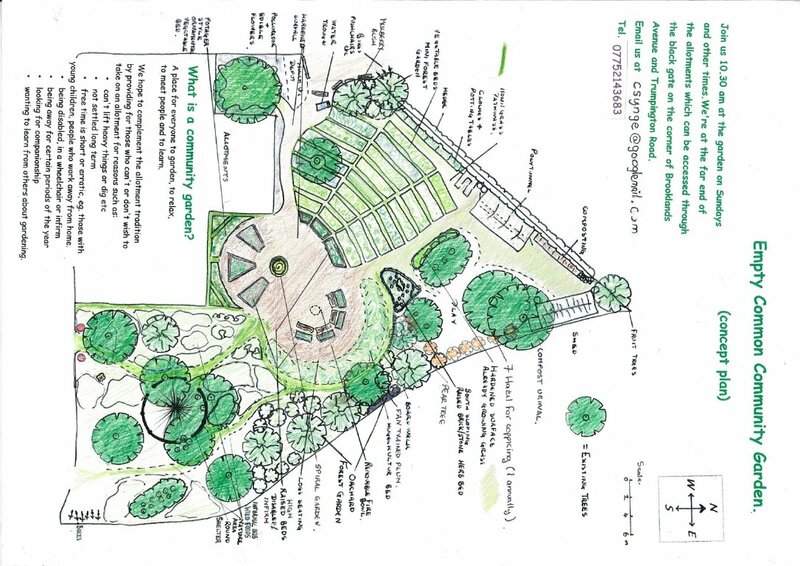 Incorporated into this design are four fruit trees, rhubarb, a gooseberry bush, hazel shrub, strawberry bed and plenty of herbs.This photograph is taken soon after planting out the main beds.The gravel areas in the path and patio areas are to be planted up which will soften the edges.